After international media raised a hullabaloo last month over 'price tag' arson, special investigation reveals culprit was electric short. 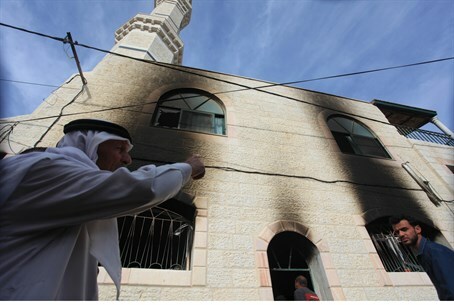 Israeli and international media was in an uproar last month after a mosque in Al-Mughayir near Shiloh in Samaria was allegedly torched in a "price tag" attack by "settlers" - a special investigative team revealed Thursday that the mosque burned in a fire caused by an electric short, not arson. After the fire dozens of Arab residents rioted at the entrance to the village and prevented IDF and police forces from conducting a thorough investigation of the fire. As a result, a special investigative team was formed by firefighting and rescue forces together with Judea and Samaria district police and general security services investigators. Judea and Samaria district Firefighting and Rescue Investigations director Reshef Shai Turgeman emphasized in the report to the police that the fire was not caused by arson, but rather apparently by an electric short in a space heater that was in the mosque and then removed from it after the fire by residents of the village. The report noted that there were no flammable fluids found at the mosque or inciteful graffiti characteristic of "price tag," and further added "in light of the findings at our disposal - there is a high likelihood that there was an electric failure around the heater and this was not arson." The element of the space heater was in fact raised by a Channel 1 reporter who visited the mosque shortly after the fire, and said that when he photographed the building from the inside, it was revealed that a fuse box under the mosque was also burned - as well as a space heater found nearby. Space heaters - which are very common in Israel - are infamous for causing fires noted the reporter, adding that he could not examine the scene too closely due to security officials cordoning off the site, apparently to avoid confrontations with local residents. However - just minutes after he saw the heater - the reporter returned to discover that someone at the scene had removed the space heater from the site.